James Montague Sandy was born in the St George area of Sydney in 1857, the son of English migrant James Sandy (d.1883) and his wife Anna. He married Evaline Martha, the eldest daughter of architect Joseph Backhouse, and had six children. He died in London on 16 July 1921, aged 63, survived by his wife, two sons and three daughters. He was interred at Eastbourne, England. His wife died on 2 January 1925, aged 63. James Sandy was educated at Camden College and Sydney Grammar School. In 1873 he joined his father’s old-established firm of James Sandy & Co, oil, colour, glass and wallpaper merchants, of George Street. In 1883, he inherited the family business which continued to expand. In 1892 Sandy took over the Australian Glass Company with 75 employees. In 1903 James Sandy & Co moved into purpose-built premises at 326–28 George Street with additional factory and office space at Ash Street and Boronia Street at Redfern. 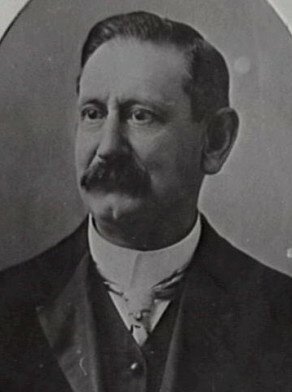 After various partnerships, James Sandy formed the family firm into a limited company in 1909 and became Managing Director. From at least 1909, James Sandy and Co supplied Sydney City Council with oils and white lead. 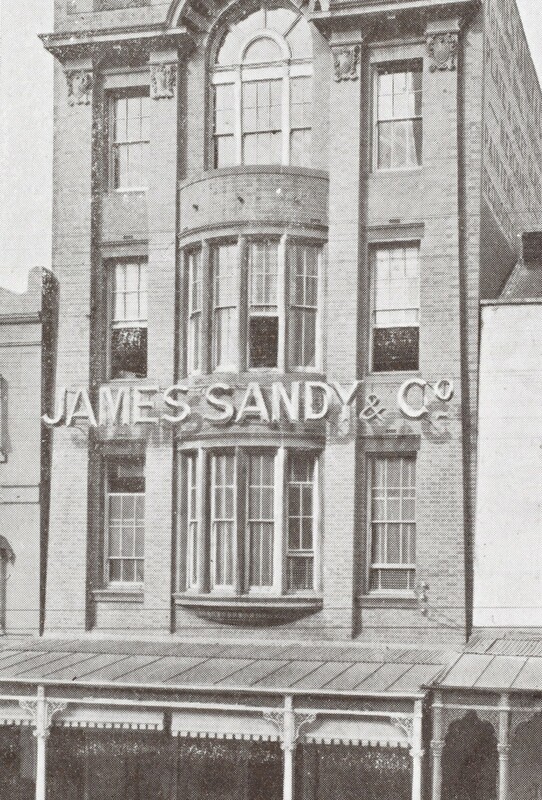 James Sandy’s sons succeeded him in the business which operated until 1961. He became a Director of the Fresh Food and Ice Co Ltd. in 1903. James Sandy was made a life governor of the Imperial Institute of England in 1900. In 1904 he was Honorary Treasurer of the Sydney Chamber of Commerce. He resided at Blenheim, Burwood. James Sandy was a member of the Benevolent Society from 1898, holding all executive positions until he became Director. He was appointed a Life Governor of the Society in 1909. He was a Director of the Sydney Female Refuge. He was devoted to the work of the Y.M.C.A., becoming president in 1919. Sandy was a prominent lay member of the Sydney Diocesan Synod of the Church of England. He was Trustee of Moore Theological College and bequeathed the James Montague Sandy Bursary to the college. He also left a bequest to the Deaconess Institute of which he had been a Trustee. 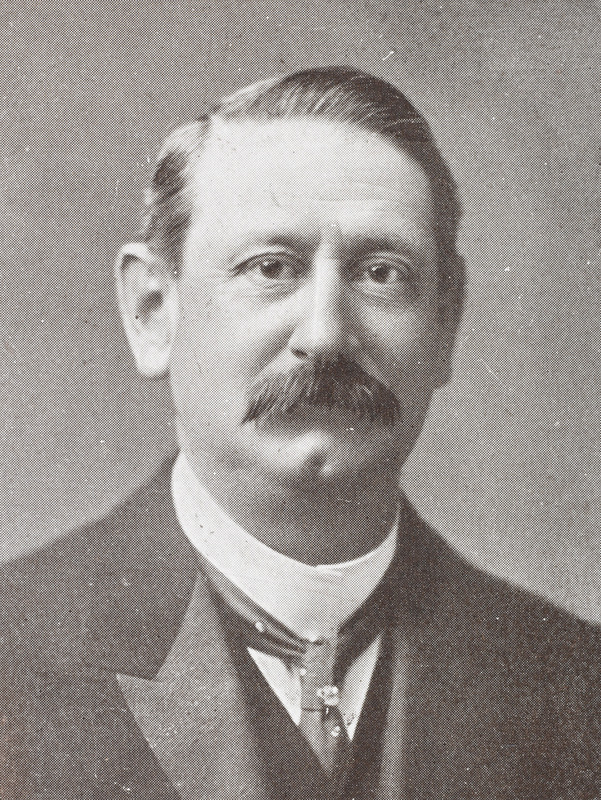 James Sandy was Alderman for Bourke Ward, 2 December 1912 to 30 November 1915. He was a member of the Health and By-Laws Committee, 1913-15 and the Electric Lighting Committee, 1913-14.